The military suspects that Islamic State-affiliated terrorists may have begun beheading Christians held as human shields in war-torn Marawi City. However, army sources believe that kidnapped Catholic priest Father Teresito Suganob — who was filmed by militants last month pleading for the lives of some 240 hostages — is still alive. Speaking to radio DZMM today (Monday, June 26), Armed Forces spokesman Brigadier General Restituto Padilla said: “We have received numerous reports on these because they have been executing all the Christians that they capture. He also said that videos of executions had been shared online and that rescued civilians had reported seeing victims executed. It is believed that about 500 non-combatants are still trapped or held hostage in Maute group controlled areas. Yesterday, five people were rescued from the conflict zone during an eight-hour ceasefire to coincide with Eid al-Fitr, the end of Ramadan. 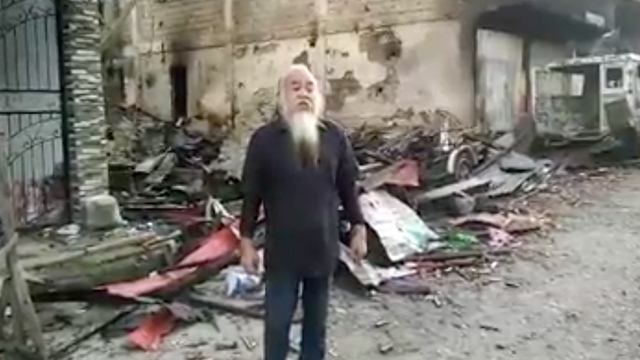 Military spokesman Lieutenant Colonel Jo-Ar Herrera said Father Teresito “Chito” Suganob was seen alive yesterday in a part of the city still in the hands of the extremists. He also said there were about 100 civilian hostages still in the hands of the gunmen, being used as “human shields”, ammunition carriers and stretcher-bearers. It has also been announced that the bodies of two militants appear to be from the Middle East, another sign that foreign jihadis have joined the battle. “These foreign terrorists involved in the hostilities are bomb experts. They are the ones facilitating the rigging of the buildings and houses with bombs,” Mr Herrera said. Eight foreign fighters, from Chechnya, Indonesia and Malaysia were killed in the early days of the battle. The battle for Marawi, which broke out on May 23 and prompted President Duterte to place all of Mindanao under martial law, has left 300 extremists, 69 state troops and 27 civilians dead.